Benchmark share indices came off their day's highs to end flat, amid a volatile trading session, as investors turned cautious ahead of key cabinet portfolios that are likely to be announced post Shri Narendra Modi's swearing-in ceremony as the 15th Prime Minister of India later this evening. 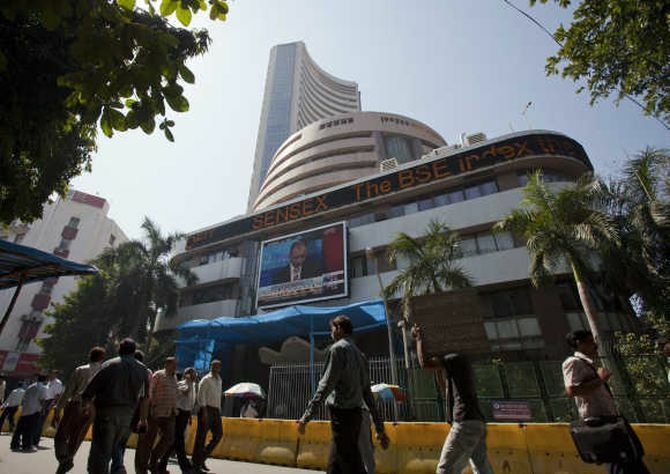 The 30-share Sensex ended up 24 points at 24,717 after hitting an all-time high of 25,175 and the 50-share Nifty ended down 8 points at 7,359 after hitting a high of 7,504. Markets recorded the fourth highest turnover at Rs 4.74 lakh crore (Rs 4.74 trillion). The India VIX, a key measure of market’s expectation of volatility over the near term, surged 12 per cent to end at 19.81. The rupee weakened against the US dollar and was trading at 58.83 to its Friday's close of Rs 58.52 after equities, which retreated from their intra-day highs, dampened sentiment. Asian stocks ended firm tracking gains in US markets and easing of tensions in Ukraine after the country's chocolate tycoon Petro Poroshenko emerged victorious in the presidential election held on Sunday. He has been given an opportunity to resolve the long lasting conflict between the west and Russia and ensure political stability. China's Shanghai Composite ended up 0.3 per cent on talk of policy measures to boost economic growth. Nikkei 225 Average gained for the third straight day to end up 1 per cent amid a weaker yen. Straits Times gained 0.2 per cent while Hang Seng ended down 0.1 per cent. European shares were also trading firm tracking gains in Asia and developments in Ukraine. The CAC-40 and DAX were up 0.6-1.4 per cent each. UK markets were closed today. Except for Auto and IT, most sectoral indices on the BSE ended lower with Realty and Power indices down 5-6 per cent each. Power, infrastructure and PSU stocks, which had led the rally last week, witnessed profit taking at higher levels. Infrastructure companies especially those involved in road-construction were among the top gainers after the National Highways Authority of India, responsible for development, maintenance and management of national highways, recently allowed nine of the stressed 23 road projects to reschedule their premium payments, a development that can revive stalled road works and attract investments. L&T which had gained nearly 7 per cent in early trades ended up 2 per cent. Among other shares in the road-construction space, IRB Infra ended up 1.1 per cent and Sadbhav Engineering closed 0.8 per cent lower. ONGC which had gained over 1 per cent ended down 0.6 per cent. Its overseas arm ONGC Videsh Ltd (OVL) signed a deal with Russia's largest oil and gas producer Rosneft to jointly explore hydrocarbons in the offshore Arctic. Select auto stocks such as M&M and Tata Motors were also among the top Sensex gainers up 2.8-8 per cent each. ITC staged a recovery today and ended up 0.8 per cent, after slipping over 4 per cent on Friday, post its fourth quarter numbers. The FMCG major reported a jump of 18 per cent in its final quarter net profit at Rs 2,278 crore (Rs 22.78 billion) against Rs 1,928 crore (Rs 19.28 billion) a year ago. Despite an appreciating rupee, the IT exporters were gainers in today's session on the back of upbeat US home sales data signalling signs of an uptick in the world's largest economy. IT majors earn most of their revenues from exports to the US. TCS, Wipro and Infosys are up 0.9-3.8 per cent,each. SBI, which surged 9.7 per cent on Friday witnessed profit taking and ended down 2 per cent. Select foreign brokerages had upgraded the PSU banking major on Friday after reporting a drop in bad loans even as higher provisioning dragged its net profit down 7.8 per cent in the fourth quarter ended March 2014. Shares of Sun Pharmaceutical Industries and Ranbaxy Laboratories ended higher by nearly 1 per cent each after the Andhra Pradesh High Court cleared the decks for the $4-billion deal to go through by lifting the stay. Among other shares, Rolta India soared 11 per cent to end at Rs 101 after reporting a strong 90 per cent year-on-year jump in consolidated net profit at Rs 139 crore (Rs 1.39 billion) for the quarter ended March 31, 2014, on the back of higher operational income. The internet software and services firm had reported a profit of Rs 73 crore ( Rs 730 billion) in the same quarter last fiscal. Hindustan Motors ended down 10 per cent at Rs 12 after the company announced suspension of work at its Uttarpara unit. Sharon Bio Medicine ended down 0.6 per cent. The company declared that its Taloja plant has been approved by the European drug agency-European Directorate for the Quality of Medicines & Healthcare (EDQM). The company said the move will enhance its sales in Europe and other countries. KEC International ended up 1.6 per cent at Rs 120 after the company said it has bagged new orders worth Rs 437 crore ( Rs 4.37 billion) in its transmission and cable businesses. The broader market which had witnessed sharp gains last week also ended lower. BSE Mid-cap ended down 3.4 per cent and Small-cap index ended down 3.7 per cent. Market breadth was firm with 1,508 gainers and 1,431 losers on the BSE. Can Modi deliver all that he promised?